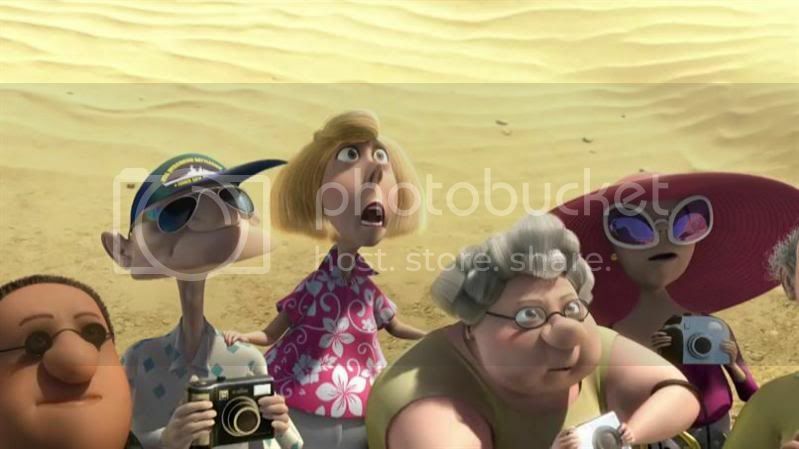 As the film opens the pyramids of Giza have been stolen by a mastermind, and discovered by an American family of tourists in one of the most biting satires of American behavior in the film. The problem is that Gru was not the evil genius behind this plot, and is soon relegated to second or third fiddle in the evil genius rankings. But he has a plan that will propel him to the top: he is going to steal the moon. But first he needs a shrink-ray, which Communist scientists in Eastern Asia have been developing. Before that, however, he needs additional funds. He heads down to his trusty banked (formerly named Lehman Brothers, says a sign above the entrance). Here Gru is reduced to groveling at the feet of a massive evil banker, in just one of the many apropos moments in the movie. The banker has turned villainy into a profitable enterprise, and prefers to grant loans only to those villains whose work can ensure high ransom figures. 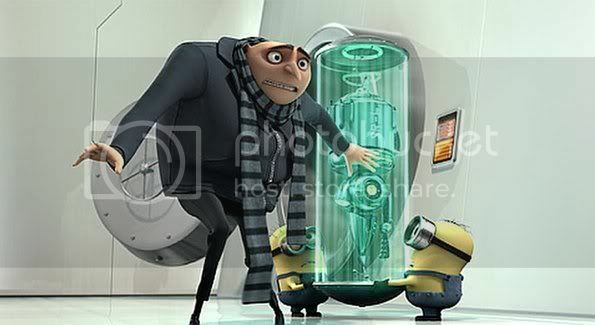 Gru is left to acquire the shrink ray on his own before the bank will assist him. However, his new nemesis, Vector (Jason Segel), is one step ahead of him, and Gru will need to infiltrate his compound in order to claim the weapon. 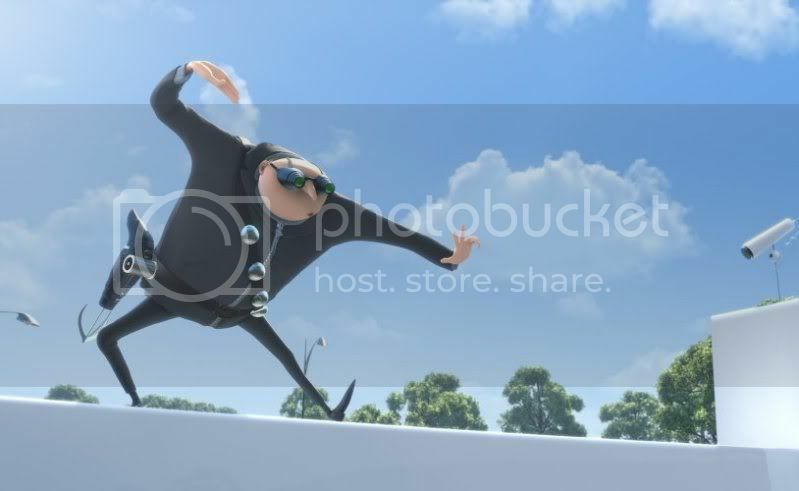 Gru’s physical attempts at penetrating his security are thwarted, and he turns to more nefarious methods of claiming the prize. After observing three young girls selling cookies, he alights on the idea of adopting them in order to gain access to Vector’s dwelling. He persuades the orphanage head that he’s a good guy, which isn’t hard when she’s busy exploiting the children and profiting from their cookie-selling. The children are adorable; Margo (Miranda Cosgrove), Edith (Dana Gaier), and Agnes (Elsie Fisher). They create a number of problems for Gru, who discovers he can’t treat them like pet dogs. The rest of the plot is fairly predictable, as Gru learns that the girls might mean more to him than even his own villainy. While the story is not particularly complex, it is sweet and pleasant, and Gru’s problems with his own mother add an extra layer to his character. But it is his villainy that is more amusing, as in an opening montage that introduces him performing various nefarious deeds. The film works on a number of levels, and doesn’t just rest on Gru’s evil nature. The minions are a highlight; the little yellow blobs with one or two eyes and goggles are immediately endearing, executing Gru’s plans witlessly and faithfully. The girls, too, are adorable, particularly the youngest. They pull at the heartstrings and poke the funny bone, but are never too trite to be annoying. 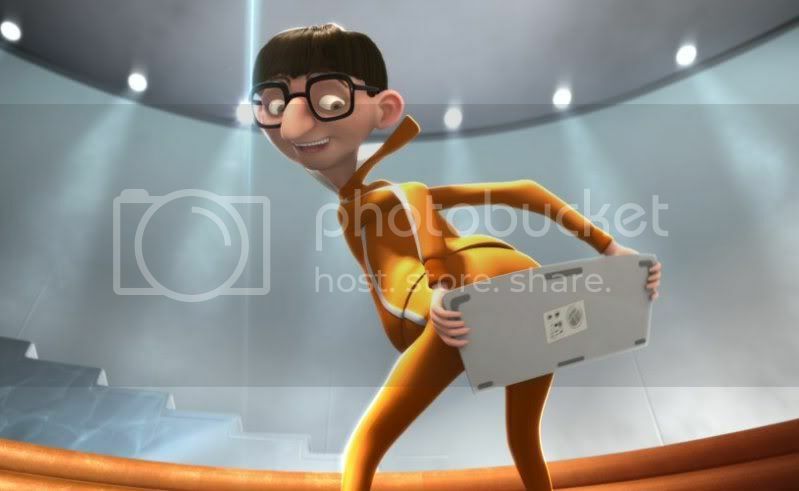 Part of the film’s charm comes from the imaginative designs incorporated into Gru and Vector’s schemes. Their houses are vastly different, with Vector’s modern home a model of modern Spartan living, while Gru sits in chairs made of giant animals. Their various aircraft and weapons are also humorous and enjoyable. It is interesting, too, just how un-American the film is. Not anti-American, mind you, just not firmly grounded in American suburbia. Cars look decidedly European, and the few coins present are certainly not American. These elements add a nuanced and different flavor to the film. Despicable Me has some timely comments to make on the economy. Gru grovels before the head of the bank, who is an even more evil man than Gru. Eventually Gru decides to self-finance his rocket to the moon, after a rousing display of support from his minions after they were told they might have to face layoffs. 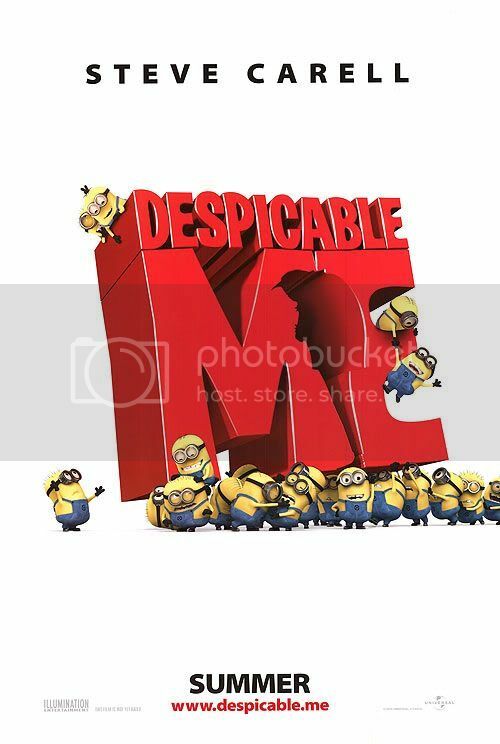 With all of these various elements in play, and the stylish and colorful palette used to draw the characters and backgrounds (at least in 2D), Despicable Me is an enjoyable family movie, with enough cute and exciting moments to appeal to children and enough timeliness and design inspiration to engage the attentions of adults.